I often find myself wondering, What is the purpose of this image? Why is this image here? Why did this photographer post this particular photograph, now, on Instagram (or publish in XYZ newspaper, website, etc.)? Who's, what's, where's, when's, why's, and how's are often on my mind, and they should be. Here in America, at this very moment, the Confederate flag is giving rise to contentious debate. Or, is there more? Can this image, whether in physical form or replicated in a photograph, result in more than debate, or mere particles of light reflecting off a human retina? (Though there is nothing "mere" about the miraculousness of the human eye or the physics of light.) Yes. It's inevitable. In fact, I would propose that your "feeling" response is the justification for the continued use and proliferation of the image form (In referencing William Eggleston's project "The Democratic Forest," it is what Alec Soth refers to as "The Democratic Jungle"; the concept of a jungle is suggested as a very apt analogy to the millions of photographs now produced each day. Imagery is itself a jungle that is becoming more and more portable.). In our respective personal experiences with any type of imagery, we know that we respond to what we see. When you see this image of the Confederate flag, although you may critique the composition or color of the image, it is far more likely that you feel an emotional response. You may feel like cursing at "the continued racism in America," for instance, or praise this "free speech protected under the Constitution." What is interesting is that, depending on the availability of the who's, what's, where's, and why's, upon seeing an image, your response may or may not change. Availability of information or context can drastically alter how we feel. It can dramatically change (y)our world. What is interesting, too, is the placement of the image. National Geographic Magazine does not (to my knowledge) publish a feature story that contains just one photograph. Nor does a cover story in TIME Magazine. (We're drawn to any series, or sequence, of images, after all, aren't we.) In other words, by "placement," I mean purpose. The who's, what's, and why's. Depending on whether words or additional photographs accompany the image, you may feel offended, relieved, confused. If I told you I made this photograph at a gas station in Charleston, South Carolina, how would you "see" (feel) the imagery? (It's Daytona Beach, Florida) Does the imagery itself, or any symbolism, change? What if I included in the photograph the gas station owner? (Are you assuming it is a "he" and that "he" is "White"?) Do we "see" through stereotypes that the photographer can control? It is extremely likely that whether the image is displayed alone affects how you "see" the image and its associated imagery. It is also almost certain that any associated images affect your response, as the sequencing shows here. And, image-makers know this reality! This is not a novel idea. 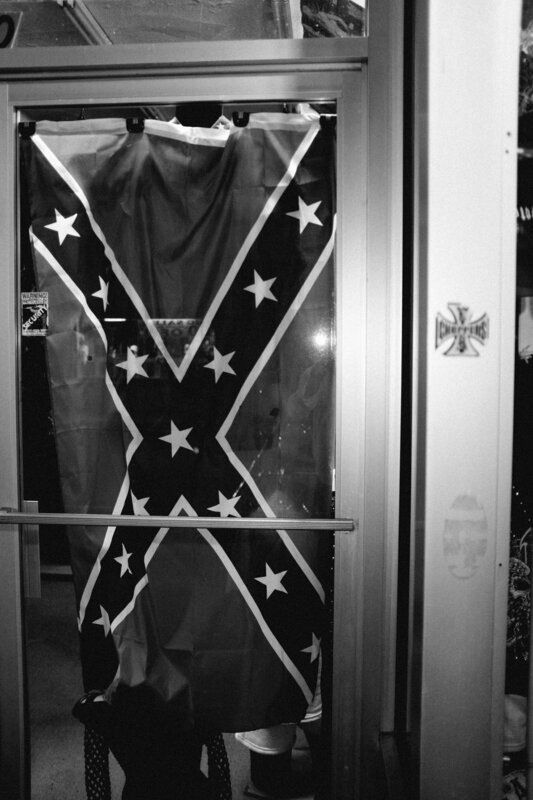 As the maker of this Confederate flag photograph I am conscious that the caption "Storefront, Daytona Beach, FL, 2016" may elicit from the viewer feelings that are far different from those feelings that the caption "Dylann Roof's Favorite Store, South Carolina, 2014" could trigger. Likewise, the feelings or other response (your way of "seeing" the physical and metaphorical imagery) that a photograph of a group of white police officers struggling to arrest a black female protester elicits changes on whether the image appears in a naked social media "post," bereft of any contextual information other than the when, or, for example, a TIME Magazine feature story that endeavors to explain that, in actual fact, since 1999, 90 percent of "protest" trials (a case alleging an assault on a police officer at a protest) resulted in guilty verdicts, where the photograph is one of seven others. In the case of the naked photograph appearing on a social media account, how to "see" the world in that particular photograph is left up to you. Did the black woman start throwing rocks at the police officers? Did another person accidentally shove her into unarmed peacekeepers? Were the police officers racist, sexist men bent on "teaching her a lesson?" Depending on the viewing platform, you genuinely may not know. What, then, is the purpose of "publishing" on this particular platform, or media, the particular photograph? Does it not beg the question, why, if the single image, absent any other complementary, narrative imagery, or even a caption, is very susceptible at eliciting from its viewers a particular feeling, or capable of rendering them persuaded of a certain way of "seeing" the world suggested in the image, then why share it on that platform? In that scenario, the image-maker decides not only what facts are relevant but also the facts themselves. And, in that scenario, the question is not only how to decipher the image-maker's purpose in wishing the viewer to see the image but also whether there are any instances where an image possesses no existential purpose. Should it not be debated that, in an instance of an image that, due to one problem of "seeing" or another (publishing platform, lack of contextual information, etc. ), the image can only plausibly elicit from the majority of viewers an emotion, feeling conclusion, etc. that the imagery of the image or the facts themselves do not support, the image serves no existential purpose? Who, however, would serve as referee? As freedom of speech and freedom of expression almost always permit such outcomes (as they should! ), the entirety of these questions are of a somewhat academic and philosophical nature. Or, perhaps there is an argument to be made that, regardless of any perceived risk of "erroneous" seeing, these are our errors to make. You, as the "seer." You as the guide, or referee, of your own world as you choose to see it. But, it is because of these realities that we should strive to remain conscious (consider the who's, what's, where's, when's, why's, and how's) when viewing any photograph. Visual literacy demands nothing less. Who wants to get lost in a jungle, anyway.